The golf course was originally known as National Golf Club and is the only Jack Nicklaus design in the Sandhills region of North Carolina. 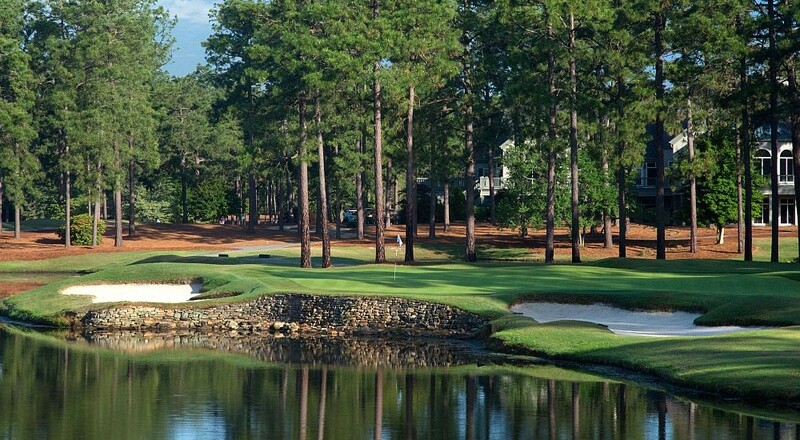 In 2014, it was purchased by the Pinehurst Resort and renamed Pinehurst No 9, joining other iconic Pinehurst courses designed by Donald Ross, Bill Coore and Ben Crenshaw, Tom Fazio and Rees Jones. The design features broad sweeping fairways framed by tall pines, large contoured greens and deep bunkers. The landscape is quite hilly and many holes have raised greens with false fronts and close-cropped run-off areas. The beautiful natural setting also includes a number of lakes and creeks. The Squad isn’t particularly long off the tee so we played the Whites at 6,128 yards. That turned out to be enough yardage for the hilly terrain and a few forced carries. It also meant we had a chance to get home in two on a couple of the par 5’s. Overall, a beautiful layout, very fair and in terrific condition. One of the challenges on No 9 is club selection. Many of the greens are raised and have false fronts, which makes it difficult to see the bottom of the flag stick and get an accurate read on yardage. It probably gets easier with familiarity but for first timers, we were short on a lot of approaches. Hint: take more club! The greens too are quite challenging. Typically they have a lot of slope and often multiple levels. Fortunately they weren’t wickedly fast but if the superintendent is ever in a bad mood, they could get downright scary. Otherwise, a lot of fun to putt. #1 gets you right into it. It’s only a mid length par 4 but the approach is over a gully to a green perched on the side of a hill. The green is surrounded by deep bunkers and a missed short approach leaves you with a sand shot to the putting surface 10-12 feet above your head. The green is wickedly sloped too. Tough start indeed! #8 is a gorgeous par 5 that trundles downhill to a green angled away from the fairway and surrounded by nothing good (bunkers, hazard, etc). It looks reachable on the card but requires a perfect second shot to find the putting surface and avoid the trouble. #10 is another reachable par 5 but is guarded by water down the right side. The green is on a peninsula. Smart people will use three shots to get there safely. #18 – who doesn’t love a strong finishing hole? It’s a 382 yard par 4 that bends slightly right for Jack’s fade. If you play it correctly the second shot need never cross any water to get to the sliver of green that hugs the shoreline. However, if your drive is left, then you’re faced with a long approach over the lake to a shallow green fronted by a stone wall. Heck, I didn’t want that ball anyway. But what a fantastic finish! 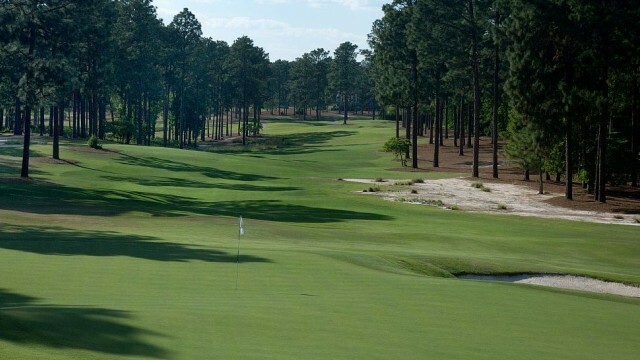 Overall, we give Pinehurst No 9 a strong SHOULD on the Must-Should-Would-Could-Don’t scale. Put it on your list. You won’t be disappointed. 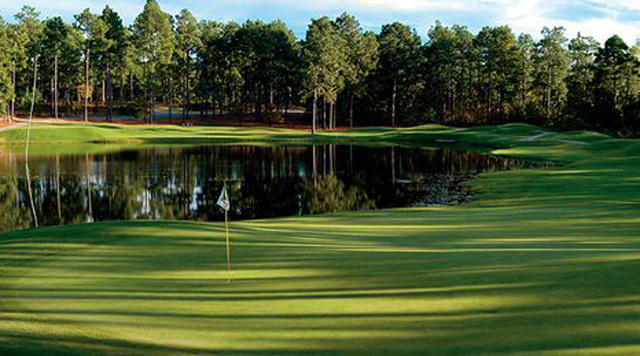 For more information about Pinehurst No 9 and Pinehurst Resort, including package rates, please click HERE. Must: fake an illness, skip your wife’s birthday, pay any amount they ask but this is one you have to play. Should: this course will be one of your highlights. You won’t ever be disappointed playing here. Would: preferable to most other courses in the area. Definitely worth a return visit. Could: nothing special but OK to play here. Don’t: go to a movie, wash the car, this course is not worth the time or money.